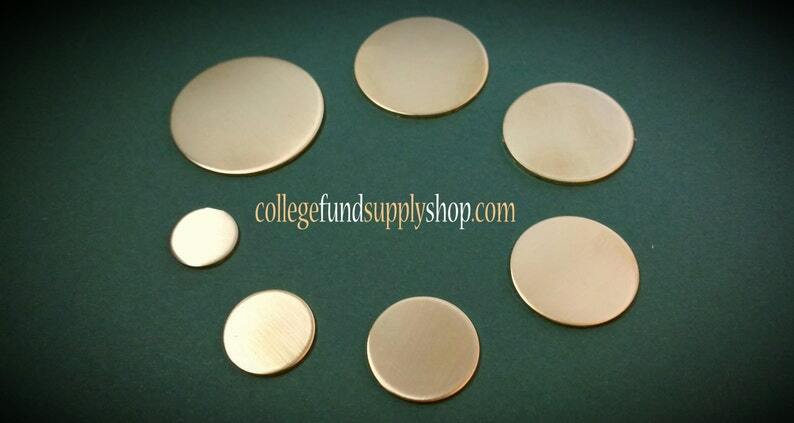 This Stamping Blank is made from NUGOLD and measures 1 1/4" round. It is a thick 18 gauge disc. Please choose a quantity IN SETS OF 3 from the drop down menu. It is perfect for stamping, etching and other jewelry design. Nugold, also called red brass, is a beautiful, warm metal..It is similar to real gold in color but is affordable. You can protect the bright finish with a coat of Renaissance wax or leave uncoated and it will slowly patina. You can leave the finish as is, tumble to a shine or sand for a brushed finish. Need a sanding sponge? You can get one here: https://www.etsy.com/listing/230468288/sanding-sponge-jewelry-tool-hand? We have just opened our supply shop and appreciate you stopping by. We are saving up money for Jasper's college and each purchase he gets closer to his goal. We plan on adding new metals and new shapes as we grow. How can you help us grow? Mention our new business in your Etsy teams, Facebook groups or when talking to other jewelry artists. We appreciate your business so much that you'll receive a 10% off coupon after your first purchase of $25 or more. Use it for yourself or pass it along to a friend. Absolutely beautiful blanks. I will definitely be back for more. Seller communicative and lovely to work with. Thank you Jasper! Always very happy with the items. Great quality. Thank you!! All from your shop. Beautifully finished, i love how the edges are not sharp. If you are unhappy about the items once you receive them, we welcome you to contact us first before leaving a bad review. Please contact us within 14 days of receiving your order if you'd like to return it or have an issue with it. We take pride in our work and hope to make your shopping experience with us a positive one. Most packages will be sent first class unless you purchase priority shipping. I will provide you with a tracking number but unless you request insurance, I will not be responsible for shipments once they leave my possession.